The group picture includes Dougal Quale, Kenny Hampton, Robbie Bell, Jack Ross. 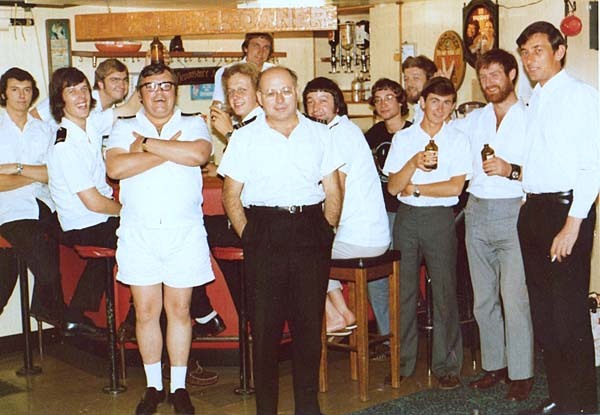 The Barman at the back looks to be Julian Smith who I sailed with on the Chiyoda Ex Eastern city. Master: J.Cann,C/O: R. A. H. Vanner, 2/O: M. Gafney: 3/O: P. Coles, R/O: J. Mathews, C/E: Eddie Morgan, 2/E: D. Jennings, 3/E: K. Walmsley, 4/E: K. Davies, J/E: P. Beavis, C.S: Pete awley, Dk Cadet: J. Pagler, E.Cadet: D. Eley. 2/3 Durban, 16/3 Vizag, 13/4 Wakayama, 30/4 Victoria B.C., 13/5 Panama, 24/5 Baltimore, 27/5 Camden, 29/5 Newark, 30/5 Newhaven, 1/6 Providence, 10/6 Corpus Christi, 27/6 Rotterdam, 16/7 Baton Rouge, 5/8 Brest. Voyage ends. Master: J.Cann,C/Os: J. Jackson & P. Deschamps, 2/O: J. Ashley, 3/O: P. Godding, R/O: Eddie Willocks, C/E: Dennis Amey, 2/E: John Cullen, 3/E: Keith Aust, J3/E: R. Saunders,J4E: M. Smith,J/E: S. Brown, J/E: A. Budge, Elect: F.Pring, CS: Leo Slawinski. 31/5 Philidelphia, 13/6 San Juan P.R., 2/7 Santa Fe, 10/7 Bahia Blanca, 24/7 Durban, 18/8 Hakata, 19/8 Nagoya, 26/8 Kashima, 5/9 Osaka, 9/9 Chiba, 15/9 Hirohata, 6/10 Panama, 31/10 Bilbao, 2/11 Falmouth. Voyage ends. Disclaimer: The statements on this page are the views of the person who posted them on the forum. The events took place many years ago and in most cases rely on those people's memories, and so we cannot guarantee the accuracy although every effort is made to check it.